FLV Acai is an interesting flavor. The room note on this thing is ridiculous. Standalone vaping it at 1%, bystanders are straight-up walking into a dense cloud made of Brookside Acai and Blueberry chocolates. But it doesn't quite taste that way to the vaper. Everything else here is an attempt to bring the vape more in line with that room note. Half of FLV Acai is a natural tart, dark berry flavor that tastes kind of like a combination of blueberries, cranberries, and pomegranate. FW Blueberry brings it more in line with that sweet candied inside of a Brookside. The other side of FLV Acai is a drier cocoa note. FLV Milk Chocolate tastes like Hershey's chocolate syrup by itself, but that cocoa side of Acai does a pretty good job of turning that into a dark chocolate candy coating. I don't much like to go the lazy "just add CAP Super Sweet and call it a day" route, but I think the way the very condensed sweetness yet still somewhat tart inside of a Brookside actually tastes really makes a strong case for it this time. It doesn't hurt the chocolate, either. Finally, it's a candy recipe. Deal with it. Sub TFA Sweetener at 1% or FW Sweetener at 0.5%. Or increase it up to 0.5% if you're a Splenda fan. Or leave it out if you value your fertility and don't want to vape those scary preservatives. Try FLV Sweetness, if you want. Whatever. A word about authenticity. I'm going to call this a Brookside Acai and Blueberry-inspired vape. You'll never get a truly authentic Brookside because those tarter berry flavors are going to come at you first, followed by a dark chocolatey finish, instead of getting the chocolate first and then that fruity middle that also lingers longer than the chocolate. So, at best, it's an inside-out Brookside. Maybe a Brookside that's already been chewed up a bit? Finally, I wanted to keep it simple and just highlight this fascinating flavor, FLV Acai. If you wanted to vape an even more authentic already been chewed Brookside for some reason, I'd start with this recipe and introduce a very small amount of a more tart pomegranate, raspberry (but watch out for those florals), or cranberry flavor. If you're brave, lemon might work even better, but good luck not getting a nasty interaction with the chocolate. Don't try to just bring in more tartness by increasing the Acai. At 1.25%, it gets drier and harsher, which of course can be dealt with, but also just a tiny bit soapy, which is harder to fix. I think FLV Acai's palatability tops out at 1%. My palate must be highly attuned to chocolate. I have been a connoisseur since I was a wee one! For me the chocolate DOES hit first, then the berry, and it finishes with a perfectly balanced mix of the two. It sat for an extra week before I got around to trying it so I don't know if the extra steep time helped in that respect. In any case it is delicious! I'll bet it pairs nicely with red wine. I will get to test that hypothesis at Christmas. If I can force myself to only vape a few tanks between now and then so I have some left by then that is! Nice job. First things first, this is about as accurate to the real thing as I think you could get. It's got a slightly sweet and tart berry. The chocolate is layered on top, but does not overpower the mix at all. For me, this is not an ADV, but it is a very tasty mix for sure. Keep 'em comin! Never have had Brookside Chocolate before but this is good. Nice and simple. I subbed out the super sweet with FLV Sweetness. 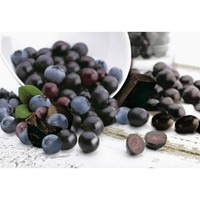 Give this a go for a good berry flavor with a light chocolate finish.